You are hereMW / Brooklyn Museum Collection, Posse, and Tag! You're It! 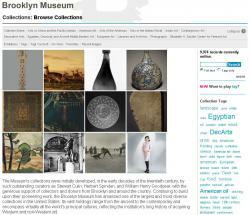 The Brooklyn Museum recently launched a project to put our Collection online with three distinct goals. First, make the data available for researchers and scholars. Second, provide a way a casual user could just jump in and start to visually navigate throughout. Third, create an interface that would be in keeping with our mission and our community-oriented goals. All of these factors are in careful balance. The strict data is there in clearly formatted areas and we provide an easy way to print this kind of information. We've implemented a very visual "related" column to promote browsing and accidental discoveries (serendipity is key). We've created a social component (The Posse) where visitors can create accounts and then anything they favorite, tag or comment on will be attributed to them both in the collection area and on their profiles. The social component is just a beginning for us and we started by implementing tagging in a slightly new way. The goal with tagging on our site is not just to gain search terms, but also to allow our visitors ownership of the collection by tagging on their terms and then attributing those tags publicly to their own Posse accounts. In this way, tagging becomes a social activity on our site. Now when Posse members contribute, their contribution is credited and we get to know more about the visitors who are helping us to apply terms to our objects. To date, the Posse has created over 45,000 tags on collection objects and 95% of the collection online has been tagged by Posse. In addition to just allowing users to tag, we wanted to make it fun as well. Tag! You're It! is a tagging game that enables posse members to play against each other (using a tag-o-meter scale) and as a posse peep gets to certain levels in the game, "thanks for tagging" videos display as people march up the scale as reward for hard work.